Every Friday from now until Christmas we will share one gift that can be given freely without a purchase and one that you can purchase. It’s all part of our Gifts of Friendship series inspired by studying The Friends of Jesus by Karen Kingsbury. Each gift we share will be presented in hopes that others will see and feel the love of Christ! This weeks gift is encouragement. Determined to press forward through times of disappointment or adversity. Hopeful when days are long and ends come unglued. Confident of who they are and all they can be with Christ. During our Friends of Jesus bible study we have discussed the importance of having friends that strengthen our faith walk. 1 Corinthians 15:58 implores us to “stand firm and let nothing move us” as we give ourselves fully to the work of the Lord. This week alone I know friends that have been shaken by accidents, divorce, unemployment and death. These times of uncertainly and trial are difficult and consuming without the hope of Christ. Encouragement can be the very gift a friend needs to remain standing. Living out Ecclesiastes 4:9-10 becomes priceless in our endeavors to serve the Lord without wavering. The gift of Godly encouragement goes to the heart of the matter unlocking the power of Jesus! Feeding the beast of negativity awakes the power of Satan. Swinging the Sword of the Spirit slays the Beast. Encouragement comes in many ways but building up one another through the sharing God’s word with our friends is priceless. Inspiring one another with God’s word when hectic schedules, heavy financial burdens, and unsettling news reports fuel bitterness, fear and disappointment becomes a weapon to destroy Satan’s best ploys against God’s daughters. Post a verse a day on your social media sites. Offer scripture rather than advice when presented with a need. Send cards with scripture notes tucked inside. 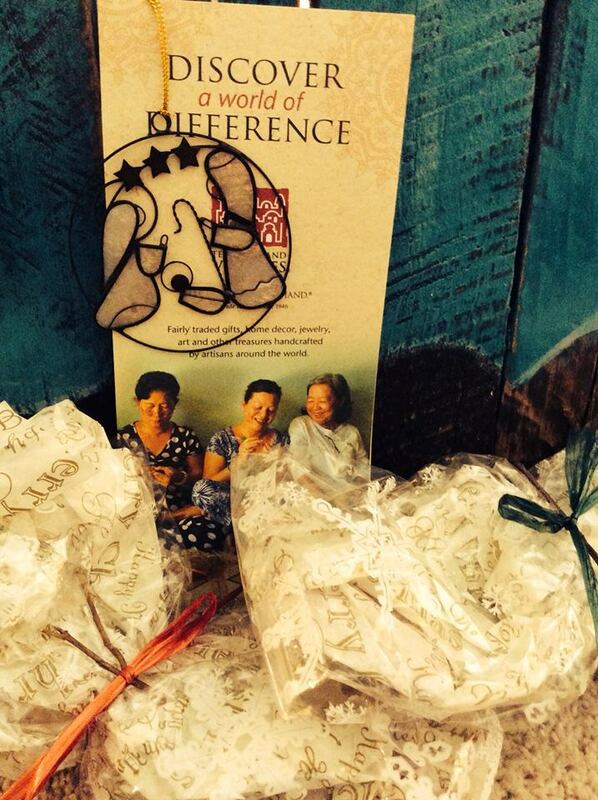 Gifts that spread the meaning of Christmas and help others simultaneously. 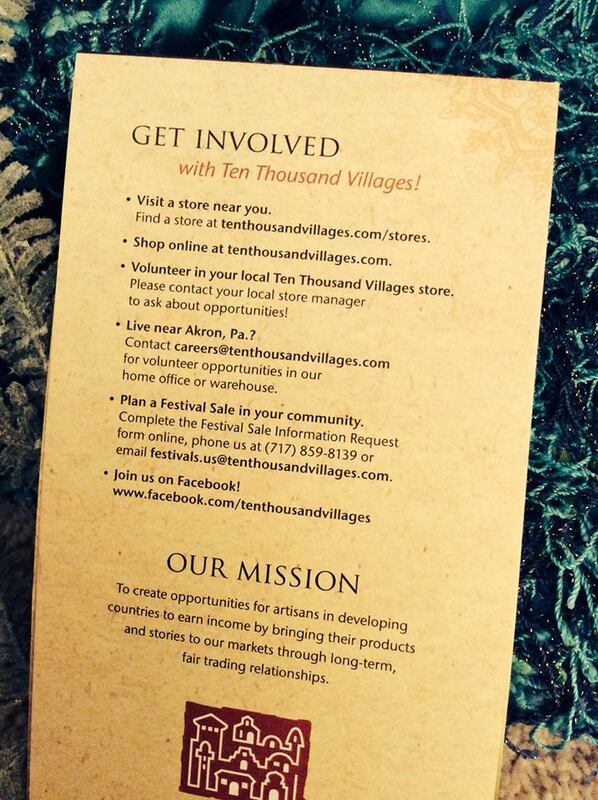 On a recent trip Donna discovered ornaments from Ten Thousand Villages that help artisans sustain a living. She brought one back to share! Next Friday we will give away the Nativity ornament pictured to one lucky gal! Enter to win: Leave a comment sharing something you have purchased that in turn helps someone in need. One winner will be selected by random drawing on Friday 12/11. Last weeks winner of our Mary Kay goodies is Junie Conner! They love to tell the story. I buy stuffed animals @ petco, for homeless animals, then turn around & donate the stuffed cat & doggie to a child or organization that provides Christmas for needy children. Helping two needs at once! That’s an out of the box idea Junie! What a great idea:) Thank you for not only “encouraging” but for spreading love and generosity this season! I’m not going to enter the contest, but I’m really happy to be visiting your site for the first time this week. Keep it up ladies!! Meg, I’m so glad you stopped over! Let’s all spread love and generosity this season so that God’s love is known to all! Thank you for sharing your hearts and Jesus’s love! Great ideas you have on this page!